As reported previously, Steve Ballmer in his keynote today at CES 2010 announced the HP Slate PC which is said to go retail later this year. What is interesting about this Slate PC is that instead of running a stripped down or a customized version of Windows or Windows Mobile, it will be running full fledged version of Windows 7 (Starter most probably). Here is what Ballmer had to say about it. They’re more powerful than a phone and almost as powerful as a PC. Perfect for reading, surfing the web and taking entertainment on the go..
HP Slate is fully multitouch capable and can be used as a Kindle like ebook reader, or as an Internet/Web surfing device; oh and it can do light gaming too. Kindle app and Frogger game was demonstrated on it during the keynote. 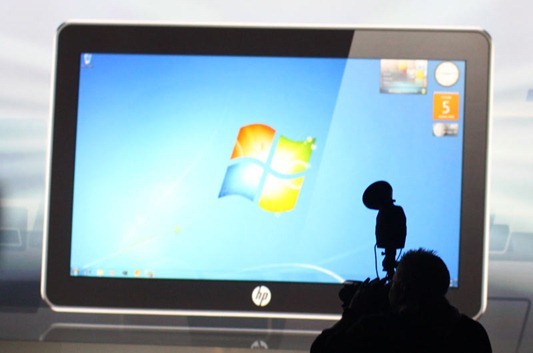 The specs of the device are still not known at the moment but HP has promised to reveal more on it later today. Official teaser video after the jump! Apple is also set to unveil a Slate/Tablet like device later this month. An official announcement about it is highly expected to be made on January 27, 2010, at Apple’s mega event which is going to be held at Yerba Buena Center for the Arts in San Francisco. Microsoft to Beat Apple to the Punch by Releasing Slate Tablet PC Tonight? You can follow me on twitter or join our facebook fanpage to keep yourself updated on all the latest from Windows based notebook/netbooks and Tablets. It should be using an ARM processor and a Pixel Qi screen. No point having an x86 eBook reader, as you have to keep it plugged in.